Gem's Up North : The Curve Fashion Festival is heading back to Liverpool this November! The Curve Fashion Festival is heading back to Liverpool this November! Liverpool's curvy fashionistas are getting super excited for the upcoming Curve Fashion Festival which hits Liverpool for the third time on the 17th of November. For 2018 the festival has a new home at St George's Hall which is a beautiful venue which has lots of space inside and it's right outside Lime street station so great for transport links. I'm particularly excited about the new venue after attending a couple of events at St George's Hall and being in awe of the building and decor! Your in for a treat guys! If you haven't heard of The Curve Fashion Festival before then let me tell you, it's a day filled with plus size shopping, shows, catwalks, talks and fun! I've attended the past two years and last years show knocked the first one out of the park so I've got no doubts that this year will be even more spectacular. Debenhams are part of the sponsorship team and they will be hosting a designer on this years 'How To' stage and doing bra-fittings throughout the day as well. 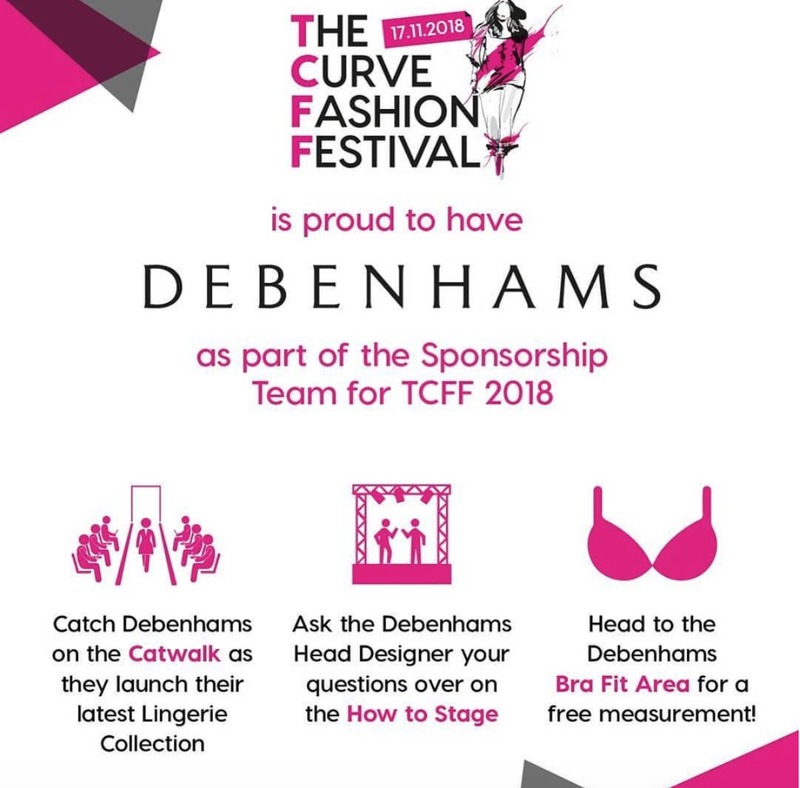 Debenhams will also be showcasing on the Curve Festival catwalk, launching their latest lingerie collection and showing some of the plus size clothing that you can pick up here. With brands such as River Island, Missguided, Yours Clothing and Pretty Little Thing showcasing at the show as well as some smaller brands like Plus Equals, Nicky Rockets and Topsy Curvy X Lovedrobe; everyone will have a fantastic shopping experience and fun filled day. Lots of the brands have competitions running on the stands, freebies and treats so make sure you head over to your favourite brands when your at the show. You can see the full list of brands that have been announced so far here but keep an eye on Curve's socials for the latest updates. This year as well as fashion brands the Curve Festival has included a Beauty Hub with beauty brands like Unicorn Cosmetics, Sample Beauty and Olivia Belle; they've also just announced that Peaches and Cream will also be in the Beauty Hub. I can't wait to meet all the beauty brands and pick up some goodies. Felicity Hayward is back for this years festival, she's the co-founder of Self Love Brings Beauty and is one of the most celebrated plus size models. Head over the the Self Love stand and catch Felicity around the festival. At 3pm on the 'How To' stage you can see Danielle Vanier with Matalan talking social media, this is one I'm not going to miss! Danielle is a blogger, consultant and designer, she will be at the Matalan stand giving attendees style tips and chatting all things fashion! Author Michelle Elman will be at Curve doing a book signing and meet & greet whilst at the show; I'm sure all her social media followers will be eager to meet her. Michelle is a body-positive activist, body-confidence coach and a TedX speaker. The Curve Fashion Festival catwalk, this one is definitely not to be missed, with plus sized brands showing their latest collections, some of them launching new ranges and its the opportunity to see the clothing being worn. The catwalk last year was one of my favourite parts of the show, you can see some of it in my YouTube video from the 2017 festival here. There is still announcements being made and although VIP tickets have sold out, you can still grab a general entry ticket here. I'll be there all day and I can't wait to shop, see my favourite brands, chat to the Beauty Hub brands and watch the Curve Catwalk! Are you going to The Curve Fashion Festival this November?